Brighten up your Sunday mornings with some special easy to make breakfast for yourself or your family. Proteins along with some fun is a great combination to start your day. Potato nests and egg with avocado shall suffice all your family’s protein requirements. They also work well to bring a smile on your little one’s face. Shredded hash browns: 15 oz. frozen and thawed. Shredded cheddar cheese: 1 cup and one tablespoon. Eggs: 8 pieces, medium in size. Crumbled bacon: 2 slices, cooked. Avocados: 2, sliced and chilled. In case you don’t have frozen hash browns, you can also use potatoes instead. Russet potatoes: 4 to 6, baked. You can peel them off and grate them in form of shreds. The first thing that you need to do is mix the following ingredients together in a mixing bowl: •	Hash browns •	Salt •	Pepper •	Olive oil •	1 cup cheddar cheese. In case you don’t have hash browns, as mentioned earlier, go for shredded baked potatoes. 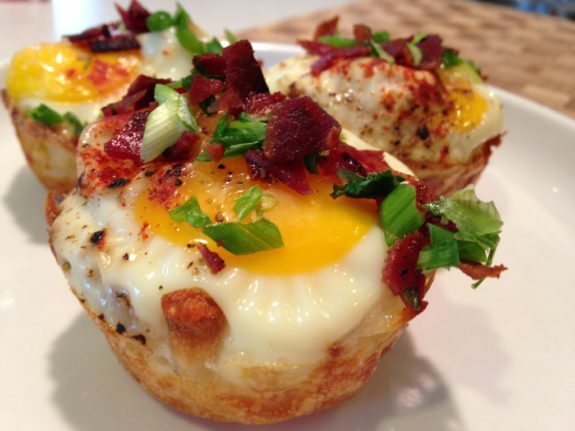 Use a muffin pan to set the nests. You need to grease the muffin pan as you normally do. Then distribute the hash brown mixture in the muffin pan and divide the mixture evenly. Use your hands to pack them tightly so that you get a proper shape for your nests. Bake at 425 degrees F for 15 minutes. The cheese melts and the sides become brown. Now take each nest and crack an egg on it. Add salt and pepper, top with crumbled bacon, 1 tablespoon of cheese and parsley and then bake at 350 degree F for 13 to 15 minutes. You dish is ready. Use a fork to lift it up. Serve while hot with avocado slices. Enjoy your breakfast. You can add a glass of juice as a complement.